With the introduction of the two newest styles of the single auger juicer, one of the questions that we have been getting very frequently is, which is the better dual-stage single auger juicer. From our previous test, its apparent tha the dual stage juicers generally yield more juice, while juicing carrots, but is there a difference between the new dual stage models? Omega, is not a new name in the juicing business. 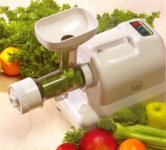 It has its roots in juicing back for over 30 years with its original model, that hasn't changed much over the years, the Omega 1000 juicer. Unlike the other juicers in the Omega product line (1000, 4000, 9000), the 8002 (and now discontinued 8001) are made in Korea. 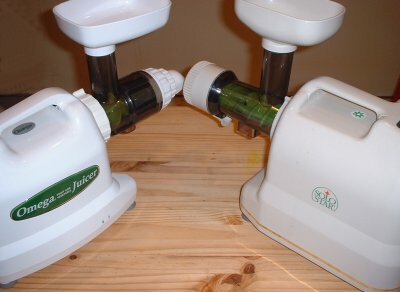 Tribest (has been in the juicer business since the early 1990s, originally introducing the Green Power twin gear juicer, which has now been upgraded to the Green Star Juicer.) It's no surprise that the Solo Star is also made in Korea. There are a few visual differences when looking at the two juicers side by side. The Solo Star has more of a square look and the Omega 8002 has more of a rounded look. The 8002 is white in color, while the Solo Star is an off-white, Almond in color. The 8002 has cord storage underneath, while the Solor Star does not. 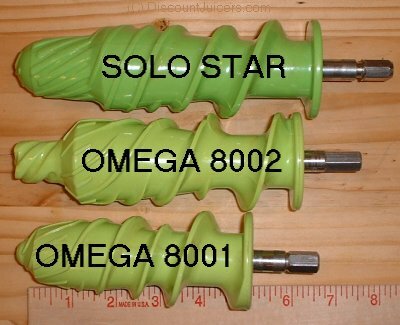 The new Solo Star Juicer and the Omega 8002 juicer have longer augers than the single stage auger juicers. The extra length in the auger is used for the extra juicing stage. As you can see by the photo to the right, the dual stage augers are about 1.5" longer. Of the two juicers we are comparing, the Solo Star auger is a bit longer than the 8002 auger. Will the longer auger translate into more juice?? In a few moments, you will read about the head-to-head tests we did with the two juicers. In the picture above, you can see the visual differences of the main housing of the two juicers. To me, it looks like the Omega 8002 took the 8001 and basically added a second stage to the juicing process. They did this by adding a different nozzle, keeping the same basic size of the old 8001 juicing screen. On the other hand, I believe the Solo Star, took a whole different approach. I believe they totally redesigned the auger and the screen, which is apparent at looking at how the juicer works. 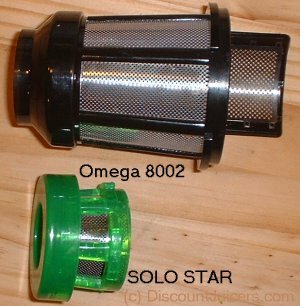 The Solo Star and Omega 8001 both encorporate the dual stage juicing design. The produce is first crushed. The juice that is released at this stageis directed to the collection tray through a filter. On the 8002, you can see this filter on the flat part in the picture above. On the solo star, the extra filter screen is built into the main body of the juicer. You can see both filter screens in the picture above. The solo star has a much smaller screen, with smaller holes (which due to surface area, is easier to clean in my opinion). We did a direct comparison with the juicing of baby orgainc carrots. We juiced a one pound bage of carrots in each juicer. You can see the results of the test in the table below. As you can see from the table above, the Solo Star produced 2.5% more juice when juicing carrots in our test. Of course, results will vary depending on the produce being juiced. Remember that loss of yield means that you are throwing extra "juice" away in the fiber! We then juiced 1 pound, 3.3 ounces of celery in both juicers. See the table below for the results. Again you can see that the difference was 5.75%, which would lead us to believe that the Solo Star Juicer is more efficient, since it does extract the juice more juice out of both of the produce items we juiced. Clean up- The Solo Star has a smaller juicing screen, which has less surface area to clean. The other juicing screen was built into the housing, and was easily washed with my kitchen sprayer. 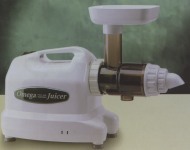 Warranty - The Omega 8002 juicer warranty is 10 years, while the Solo Star juicer is 5 years. Better for homogenizing due to both screens are entirely plugged when operating.